It has been a while since we last featured a mirror because there isn’t often that much of interest around, but this mirror from Mirror Mirror is worthy of a mention. 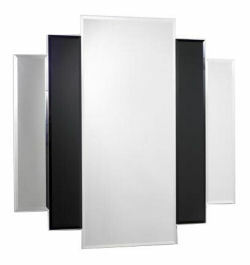 They are calling it simply the Retro Black & Silver Mirror but it could be described as an Art Deco mirror as its stepped shape and contrasting colours have characteristics of that style. It costs £235 and is made to order. Enquiries can be made via the Mirror Mirror website.